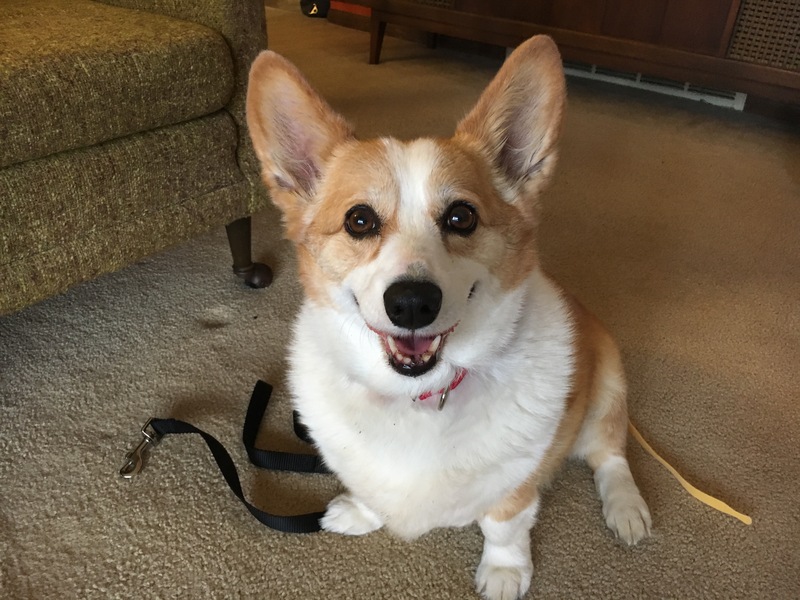 Bunny is a nine-year-old Pembroke Welsh Corgi who lives in Omaha. Her guardians reached out to set up a dog behavior training session with me to address her baring teeth and growling at the family’s 10 month old toddler. After sitting down with the guardians and Bunny, I determined that a lack of rules and structure had confused the dog into thinking she had the same authority as her humans. I went over a number of ways to change this, including adding rules and boundaries, teaching Bunny to defer or wait and to literally follow the humans instead of moving in front of them. I also recommended that they start petting her with a purpose, use passive training to reward her for engaging in desired actions and behaviors and to look for opportunities to delay gratification to help her develop more self control. Now I was ready to show the guardians how to train a dog to move away from the baby when the toddler approaches her. Bunny picked up on this technique right away so adding a reward and command word to this positive dog training technique was easy. I recommended that the guardians practice this often as the more they repeat it, the more this becomes a behavior that Bunny will do on her own, unprompted. Practice at this exercise combined with a strategically placed kennel will help bunny feel empowered to move away from the baby instead of baring teeth or growling a warning when he gets too close. While teaching Bunny to move away should eliminate the feeling to disagree or warn the toddler, I also wanted to give the family a technique to help the dog start to build up a positive association with the baby. The most common way to do this is a technique called counterconditioning. By providing Bunny with high value treats when the baby approaches her, the guardians can help her start to associate the arrival of the toddler with the presence of the tastiest treats she has ever had. With a little practice, Bunny will start to seek out the presence of the child rather than seeing it as something to disagree with. Get a kennel and place it strategically as detailed so that Bunny can get inside but the baby cannot. If necessary cover the exposed part of the kennel with plexiglass or cardboard to prevent the toddler from sticking his hands inside. Practice dropping a treat in between the wall and kennel and saying a distinct command word the second the dog licks up the treat. Increase Bunny’s daily exercise via walks, games of fetch or the leadership exercise to burn off excess energy and stimulate her and help her feel wanted. Once Bunny has developed good walking habits, start walking her with the neighbor dog she barks at. After walking Bunny with the neighbor dog for a week (neither dog should be in front) they can try some off leash play in the neighbor dog’s yard. Start petting Bunny with a purpose. Stage a scenario where the humans can practice some counterconditioning at least once a day (more is better) with 5-12 high value treats. Try to practice the counterconditioning after Bunny has been walked. Whenever possible play with Bunny after practicing the counterconditioning exercise. Set a goal of playing with Bunny 3 or more times a day; fetch, pull game, etc in short 2-3 minute play sessions. Use passive training to reward Bunny for any desired actions or behaviors. Establish an invisible boundary around the front door and nursery to help Bunny learn to respect boundaries. Look for ways to delay gratification to help Bunny develop more self control. Practice having Bunny move away when the baby approaches a few times a day. Put Bunny in the basement any time she shows stress or the human cant closely monitor her. Start eating a few bites of something before feeding Bunny and remove any remaining food when she walks away from her bowl. Add in some chopped up green beans to help Bunny feel full after eating slightly less food.